I love this song! Kinda busy! 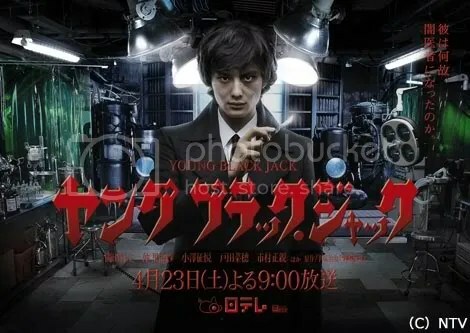 English Subtitles for Young Black Jack starring Okada Masaki Now Available! It was etched in my brain that Young Black Jack will show on April 23 so when April 23 rolled in, I checked D-Addicts and there it was! I didn’t download it yet because I was afraid someone will hardsub it and I’m left with the raw with no softsubs. I checked the forum topic and there it was! Someone will sub it! I was checking the topic everyday and after 1 week, THE SUBS ARE DONE! HUZZAH! And I am now delivering it to you! Go! Download it now! 😀 I know I will! Click under the cut for more pictures! I love the background SO MUUUUUCCCCHHHH. I want my future house to look like this. Choz. I just saw this track on musicphileosophy.com and tried listening to it and now I can’t stop replaying it! I’ve been listening to it ever since I loaded the track! I dedicate this to Sarah HAHAHA! P.S. They have free downloads on their tumblr HEREHEREHERE! I know I haven’t been posting much. I don’t actually read that much news nowadays. I’ve been watching and watching seasons after seasons of lots of series so yeah, I’m occupied with something else. Since I like bullet points, everything that happened and will happen in bullets! The night I “applied” for Yoo Ah In Haven, I also applied as an editor for Fighting! Fansubs. And they are so kind to include me in their family! I’m working on 49 Days and I’m just waiting for Episode 8 to be spotted and I’ll be editing. I thought editing was easy but no, it’s not. I’ll have to watch the thing over and over again to make sure everything’s right. And with my mindset about giving back, the subs must be perfect. Good luck and yey to me! My dream of becoming a fansubber is in fruition! And thus, I have less time again. I’ve finished Seasons 1 and 2 of The Big Bang Theory and Season 1 of The Vampire Diaries and boy am I addicted. Haha! Season 2 of Vampire Diaries isn’t done airing yet so I’m actually downloading today’s episode and I’m so on edge because I cannot wait to watch it. I was marathon-ing season 2 today and I thought by the time I finished episode 18, my episode 19 download will be done. Once again, I was let down by my Internet speed. That’s why I’m blogging right now and whatever, to let time pass and not watch how slow the download is. I’ve applied as a tutor/lecturer this summer and I was accepted though the problem is, the review center I applied for have no enrollees and tutees so I don’t exactly have a job right now. I’m applying for one again on Tuesday and I hope that gives me a job. That means I won’t be able to watch as much and blog and sub as much but at least I have money. Haha! And now, I’m currently categorizing my posts. I forgot that I haven’t finished that up so yeah, yeah, yeah!